Monthly Progress Update: Have You Seen APD’s Latest Progress Report? 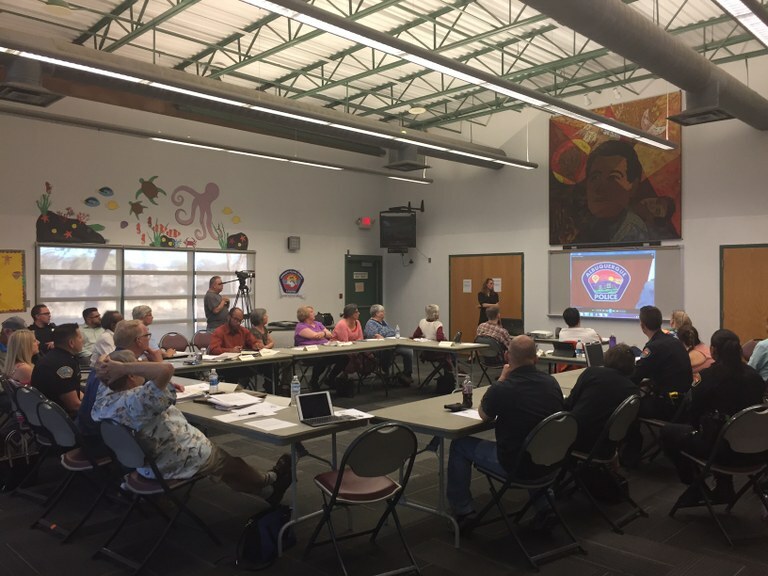 APD Partners with Community Policing Councils to Host Successful City-Wide Briefings and Review APD's Latest Progress Report. ALBUQUERQUE, N.M. – The Albuquerque Police Department and the City’s Community Policing Councils successfully completed a series of open dialogue meetings updating the community on the Department’s latest progress concerning our Court Approved Settlement Agreement. Meetings were held in during the month of March at each of the six regularly scheduled Community Policing Councils. More than 250 people attended the meetings. Residents had myriad of productive questions which covered everything from staffing and recruitment to how the Department is addressing concerns voiced by the Independent Monitor. The most recently distributed APD agency report is published in a new format. The report is 15 pages long compared to previous reports which spanned more than 300 pages. The shorter format was implemented to make it easy to read and easier to understand. Each policy related to the Court Approved Settlement Agreement (CASA) must be updated within six months of finalization and then updated annually. About half of the community’s suggestions concerning policy development have been accepted by the Department. Further reinforce “Show of Force”, “Supervisory Use of Force Investigations”, and what is classified as a “Serious Use of Force”. Also discussed the role of the Civilian Police Oversight Agency in reviewing cases. Six Sigma management training – for sworn and civilian managers. Misconduct complaint intake and investigation training. Cultural sensitivity training – panel of different ethnicities discuss perspectives on history of policing and cultural contexts for body language and communication styles. From January of 2016 to October of 2016, field officers made more than 2-thousand contacts with individuals experiencing some type of crisis. Only six of those resulted in any force, being used. APD plans to have 40-percent of the field services bureau Enhanced Crisis Intervention Trained. Mayor’s office created and launched Mobil Crisis Teams. Did you know? Officer involved shootings have decreased 53% from 2010 to 2016. Overall firearm discharges, which includes any time an officer deploys their firearm, have decreased 72% from 2010 to 2016 and the Albuquerque Police Department graduated a total of 93 recruits from its academy in 2016 which is the most in more than a decade. This and other important information is discussed at Community Policing Council meetings. We appreciate the independent councils for hosting our city-wide briefing updates.